0 AD, the free and open source RTS game, has now reached its alpha 20 release, according to the latest announcement by the developers. This Alpha features 10 new maps, core functionality for a cinematic in-game camera, the ability to share dropsites with your allies, to name but a few new features of this latest release. 0 AD is available free of charge for Linux, Mac OS X and Windows and the developers give an assurance that it always will be gratis. This release is named after Timosthenes of Rhodes, who was a Greek geographer and navigator who served as the chief pilot and admiral of King Ptolemy II Philadelphus’ navy in the 280s-270s BCE. Today, 30th March, is Document Freedom Day, an annual celebration of the benefits of using open standards and open formats for the production and exchange of documents. Open standards are essential for interoperability and freedom of choice based on the merits of different software applications. They provide freedom from data lock-in and the associated vendor lock-in. This makes open standards essential for governments, the public sector, companies, organisations and individual users of information technology. Available in multiple complete implementations by competing suppliers or as a complete implementation equally available to all parties. Examples of open formats include Open Document Format (ODF) and plain text (.txt). Examples of open protocols include the Transmission Control Protocol (TCP) and Internet Protocol (IP), which together as TCP/IP help determine how the internet works. What do open standards mean for you? What do open standards mean for society? More accessible high-end software for innovation and experimentation. Originally posted on the author’s blog. Le Monde Informatique reports that Samsung is currently developing an open source operating system tailored for the Internet of Things (IoT). Details of it will be given next month at the South Korean company’s developers’ conference. 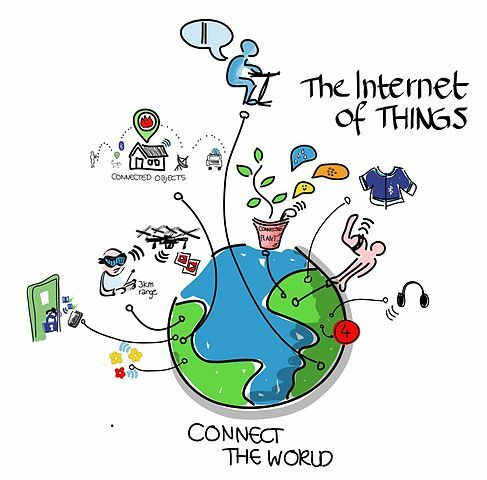 In order to gain a larger place in the world of domestic appliances, clothing, accessories and other connected items, Samsung has initiated the development of a new operating system for the internet of things. This OS, which will be open source and has not yet been named, will assist terminals in carrying out simple tasks quickly and without human intervention. The software could for example unlock a locked door and turn on the lighting of a house when one of its residents is approaching home. More details will be provided next month during a technical session to be held at Samsung’s developers’ conference in San Francisco. In addition, this OS has also been announced as being real-time enabling it to process data more quickly and with no latency. Samsung’s new OS could be a stripped down version of Tizen, which is already used in the company’s smart watches and television sets. This new arrival will form part of the huge connected equipment programme foreseen by the Korean company, which includes cookers, refrigerators, washing machines and even light bulbs. Furthermore, Samsung is suggesting the Artik card to act as the basis for the design of connected terminals. The company’s new OS could enable developers to connect their products with its SAMI cloud platform for analytics, security and other services. For example, a cloud service cloud could turn the air conditioning on or off according to the information supplied by a telemetric sensor. It could also analyse health information received in the course of time. Samsung’s IoT OS could also be compatible with other IoT development platforms such as AMD’s mbed or Google’s Brillo. The latter is already supported by development cards, including Intel Edison. Multiple antenna technology, also called MIMO, is already used in many Wi-Fi routers and 4G cellular phone systems. Normally this involves up to four antennas at a base station. Using a flexible prototyping platform from NI based on LabVIEW system design software and PXI hardware, the Bristol configuration implements Massive MIMO, where 128 antennas are deployed at the base station. The hardware behind this demonstration was provided to Bristol University as part of the Bristol Is Open programmable city infrastructure. Lund University has a similar setup, the LuMaMi testbed, thus enabling researchers at both institutions to work in parallel with their development. Bristol’s Massive MIMO system used for the demonstration operates at a carrier frequency of 3.5GHz and supports simultaneous wireless connectivity to up to 12 single antenna clients. Each client shares a common 20MHz radio channel. Complex digital signal processing algorithms unravel the individual data streams in the space domain seen by the antenna array. The Massive MIMO demonstration was conducted in the atrium of Bristol’s Merchant Venturers Building and achieved an unprecedented bandwidth efficiency of 79.4bit/s/Hz. This equates to a sum rate throughput of 1.59Gbit/s in a 20MHz channel. The collaborative research project with Lund University and National Instruments included 5 Bristol-based PhD students and 5 academic supervisors. In Lund 7 PhD students and 6 supervisors were involved. Engineers from Bristol University are involved in the dReDBox consortium that will be working on a three-year project, funded through the EU’s Horizon 2020 programme to develop an improved cloud computing server. In today’s cloud data centres, the physical system comprises individual server units contributing processing, memory, accelerators and storage resources. However, this arrangement results in a significant waste of these resources, as well as low power consumption. This is due to the inability to match user IT requirements closely with the available resources within a single server or sets of servers. The challenge in this arrangement is to be more efficient, flexible and agile. 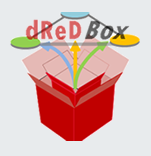 The new dReDBox design aims to improve resource use and lower power consumption by moving from today’s server-as-the-unit model to a pooled-computing model, enabling an arbitrary sizing of disaggregated IT resources, locating them where and when required, to match cloud user requirements perfectly. By so doing, dReDBox aims to provide unprecedented efficiency levels while reducing electric power consumption by up to 20%. Dr Georgios Zervas, Senior Lecturer in the Department of Electrical and Electronic Engineering and the University’s project lead, said: “dReDBox is an exciting project that aims to transform the existing data centres by making the IT building blocks, processor and memory units, communicate with each other at the speed of light. The modularity of the system would allow for a wide range of deployment scenarios spanning across small-scale mobile/edge and fog computing systems up to data centre farms. The dReDbox consortium, which is led by IBM Research – Ireland, involves several prominent European research and development organisations, including Telefonica (Spain), the University of Bristol (UK), the University of Thessaly (Greece), the Foundation for Research and Technology (Greece), the Barcelona Supercomputing Centre (Spain), NAudit (Spain), Sintecs (Netherlands), Virtual Open Systems (France) and Kinesense (Ireland). There’s a general media adage that says never let the truth get in the way of a good story. It seems this maxim is now being applied by members of the fourth estate to that most concise social medium, Twitter. Rukmini Callimachi, to help promote a piece she’d written on November’s terrorist atrocities in Paris. Below is a screenshot of the 11th tweet in this series. Ms Callimachi’s conclusion: gibberish = encryption. 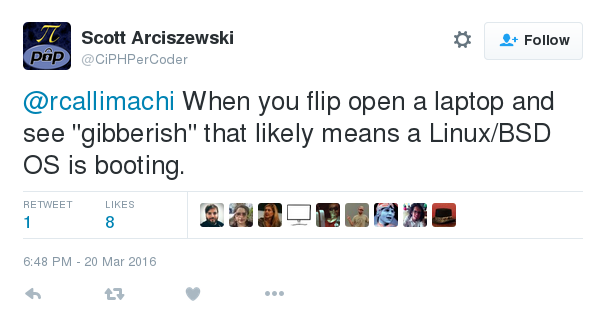 However, she received short shrift on Twitter for her ignorance from those with more technical nous than your average US hack, such as the following tweet from Scott Arciszewski, which was representative of those from techies. For technically illiterate hacks, below is a shot of what (part of) a typical Linux or BSD system booting up looks like (a similar effect can be achieved on Windows boxen by disabling the boot splash screen and opting for verbose output. Ed.). 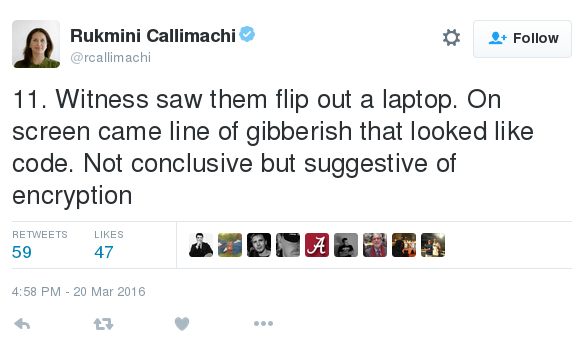 It seems obvious to your ‘umble scribe that Ms Callimachi has never used a system with an encrypted hard drive. Before starting the boot sequence, the user is asked to key in the encryption keyphrase. Without this, the system won’t even boot. The moral of this tale is clear: beware if ever a New York Times hack or some other technically ignorant “journalist” sees your Linux or BSD machine booting, you’re likely to be falsely labelled as a terror suspect. Friday’s Western Daily Press reports that it has come to light that almost half of homes and businesses in rural areas described as “live” on broadband maps are not connected for fast speeds, i.e. a minimum of 24 Mbps. 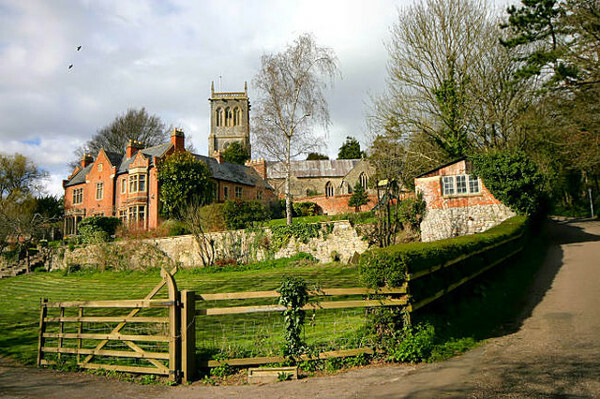 Forty-eight per cent of rural premises – believed to be some 1.5 million people – have to endure speeds of under 10Mbps and of those 22 per cent cannot obtain speeds above 5Mbps, according to Graham Long, chairman of the Broadband for Rural Devon and Somerset campaign group. The reason so many rural customers have to tolerate low broadband speeds is because a large proportion are situated more than 1.3 km from a cabinet. Cabinets are being connected to the fibre network as a cheaper alternative to providing a fibre connection to the premises for every rural customer. To support its claims, Broadband for Rural Somerset & Devon has produced a factsheet (PDF) detailing their findings. In response, the Department for Culture, Media and Sport (DCMS) pointed out that only premises able to receive speeds of at least 24Mbps were counted in its success figures. Who is correct? Mr Long or the DCMS? If you have the answer, please add it to the comments below. The US government wants to save taxpayers’ money with reusable software and open source. 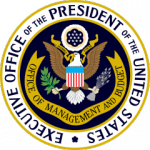 To this end the White House’s “Office of Management & Budget” (OMB) presented a draft “Source Code Policy” (PDF) at the end of last week, German IT news site heise reports. According to this draft policy, computer programs developed especially with public financial resources are to be used in principled throughout the entire administration, i.e. not just in the commissioning authority. Part at least of the source code produced shall also be made available to the public as open source software. Standard programs such as office packages are excluded from this policy. During a pilot programme the authorities involved are initially to release 20% of the source code under an open source licence if outside programmers are involved in development. Software which administration officials write within the scope of their official duties will have to be released in its entirety although there will be exceptions for source code for systems developed for the purposes of national security. Tony Scott, the US government’s Chief Information Officer (CIO), believes that the project will promote innovation and collaboration and reduce costs. It should also be possible for experts to be able to examine and improve the source code. Only this will ensure that programs work more securely and reliably. According to Scott the initiative also fits into the administration’s plans for technological neutrality and new economic development models. The draft policy is out for consultation until 11th April, after which it will be decided and implemented. 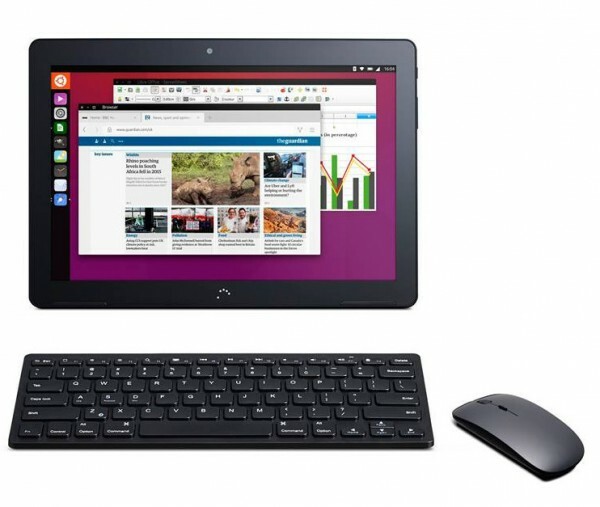 In a brief post on Facebook, Ubuntu announced yesterday that it would soon be launching its first ever Ubuntu Linux-powered tablet, the BQ Aquaris M10. For this project, Ubuntu has partnered with smartphone, tablet and e-reader manufacturer BQ. No further details of this tablet’s launch are yet available, although a publicity video has been produced. Canonical had the BQ Aquaris M10 tablet on display at the MWC (Mobile World Congress) 2016 event held in Barcelona at the end of February, according to Softpedia. Although no launch date has been announced, it is believed the tablet will be available some time in April. This new piece of Ubuntu hardware joins the Ubuntu Editions of the Aquaris E4.5 and E5 HD smartphones and the MX4 smartphone built by China’s Meizu. In recent years, Canonical, the British company behind Ubuntu Linux, has developed the operating system so it works on other devices ranging from mobile phones to drones. Update 24/03/2016: Softpedia has now reported that the tablet will be available for pre-order on 28th March. 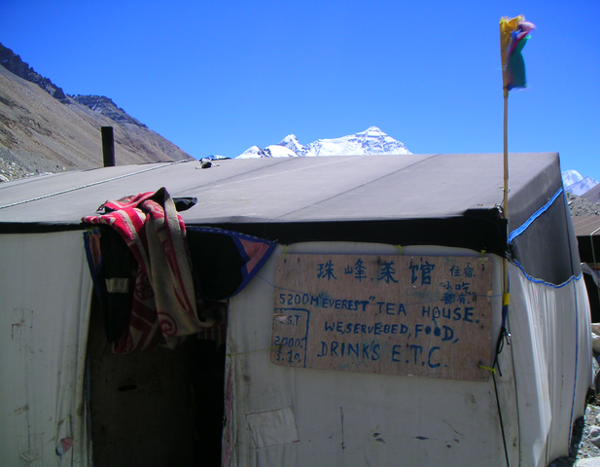 News emerged last week that Everest Base Camp in Nepal has better internet connection speeds than some villages in Somerset and Gloucestershire. Research by Cable.co.uk revealed that Brent Knoll in Somerset has a download speed of a mere 1.3 Mbps. This is easily beaten by Everest Base Camp’s satellite internet link which has an average connection speed of 2 Mbps, according to The Independent. However, Brent Knoll’s internet speed can be regarded as blistering if one happens to have the misfortune to live in Miserden in Gloucestershire where the slowest download speed recorded by a resident using Cable.co.uk’s speed checker was 0.12 Mbps. 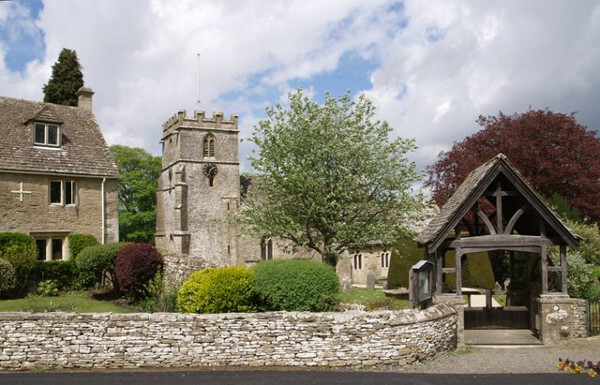 Besides these 2 “notspots” Ashwell in Hertfordshire, Ulverston and Gilsland in Cumbria were the other towns and villages to make up the five slowest in the UK. By contrast Rickmansworth, in Hertfordshire, was the place with the fastest average speed at 77.17 Mbps – more than three times the UK average of 22.8 Mbps. This report doesn’t give an entirely accurate picture, as fibre broadband is widely available to the slowest areas identified. Fibre is available to 81% of those connected to the Brent Knoll exchange – a far cry from the ‘digital black holes’ described. This report is either based on out-of-date information or on the speeds people choose to buy rather than the maximum speeds available to them. For an accurate view, we’d encourage people to look at respected, independent reports by the likes of Ofcom, the EU, the International Telecommunication Union and ThinkBroadband. Digital inequality is a huge problem in the UK, both for those who suffer at the bottom end and for the UK economy as a whole. While the number of UK households on the right side of the ‘digital divide’ is increasing thanks to the continuing roll-out of superfast broadband, those left stranded are finding themselves further and further behind – to the detriment of both themselves and their local economies. The EU is supporting Member States in modernising their public administrations with €131 mn. to make interoperable digital services available to citizens and companies. To this end, EU Commission Vice-President Andrus Ansip and EU Digital Commissioner Günther Oettinger launched the new ISA2 (Interoperability Solutions for European Public Administrations) programme in Brussels last Thursday. The ISA2 programme, which runs from 2016 until 2020, builds on the success of the preceding ISA programme, which developed more than 20 e-government solutions (e.g. management tools for online tendering, development and analysis of online surveys, etc.) which have since been implemented throughout the EU. Public sector organisations can save citizens and companies time and money by using ISA solutions at European, national, regional and local level. The Commission’s recently-published report (German) into to state of digitisation in the EU reveals amongst other things that only one in five German internet users (19%) currently uses electronic official services (e-government), compared with one in three (32%) throughout the EU. Furthermore, the EU Commission has also recently published the initial results of the public consultation into broadband roll-out and the revision of existing telecommunications regulations. CiviCRM is a great free and open source CRM package that’s used by thousands of organisations (many in the community and voluntary sectors. Ed.) around the world to maintain their contacts database, produce email newsletters and much, much more. We at Bristol Wireless have been using CiviCRM for many years for those first two above-mentioned purposes and it’s more than proved its value to us. Yesterday, 24th February, was designated as CiviDay 2016 – an international celebration of CiviCRM that embraced 24 events held on 3 continents around the world at venues ranging from the headquarters of the Free Software Foundation in Boston, MA, to social centres. There were originally 25 events planned, but the one in St Louis, Missouri was postponed due to snow! Bristol hosted one of three CiviDay events in the UK, the others being in Manchester and London. 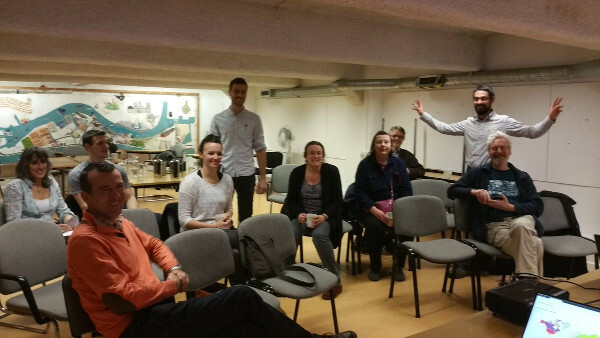 In Bristol we were the guests of Circle Interactive, the local web design, Drupal and CiviCRM consultancy. The attendees themselves presented a broad range of skills and experience covering at the two extremes people who were simply users of CiviCRM in their daily administrative work to those actively developing and customising the software. Some of the attendees at Bristol’s CiviDay 2016. Photo used by kind permission of Sean Kenny. Circle’s Sean Kenny opened proceedings with a short presentation for new users (of which there were none in attendance. Ed.) before a short break. Sean then handed over to Michael McAndrew, CiviCRM’s community manager. 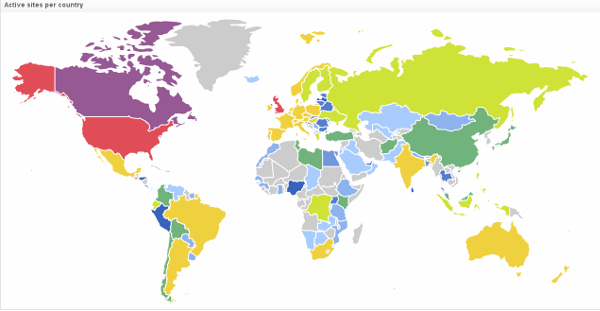 CiviCRM use around the world. The largest numbers of the package are deployed in USA and UK respectively. After some background facts and figures, Michael’s talk focussed on the future and what 2016 in particular held for the project. Michael remarked that version 4.7, the latest release, will be the last of the 4.x series. 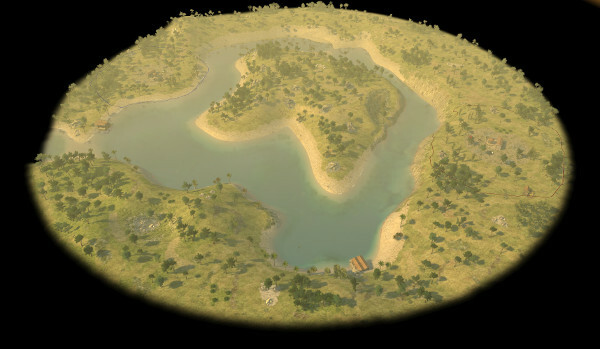 All future development effort will be concentrated on preparing for the next major release – version 5.0. The first release of the 5 series will be made available when a number of changes have been implemented, including a new API with business logic, a new theme layer and a flexible form builder. Michael also pointed out that user input would be very valuable for the development of CiviCRM5. One final area that was discussed at length was fundraising, that constant bane of any mature open source project. A number of pertinent points were raised by attendees both during the presentations and the final informal circular huddle. One of the most interesting of these was raised by a gentleman from the RNIB, who mentioned the specific accessibility problems some of his visually-impaired users faced with their later versions of CiviCRM and screen readers. Michael suggested these could be mitigated in Version 5 via the new theme layer. Another question raised was the use of CiviCRM to personnel management, better know these days by the acronym HR. CiviCRM can be used as it is to perform many HR tasks, in addition to which there’s also the CiviHR module which converts the CRM into a HR system. However, as more than one user pointed out, using CiviCRM for HR purposes does require the implementation of access control levels. One very useful UK-specific plug-in that was mentioned will be of particular interest to British charities who use CiviCRM to record donations; and that’s a plug-in for administering Gift Aid, the tax relief UK taxpayers receive when they donate to charity. The plug-in will communicate with the taxman to make sure relief is claimed. The session ended with a commitment to resume regular local Bristol CiviCRM meet-ups and an announcement that Circle Interactive will be holding 2 CiviCRM training days soon, one each in both London and Bristol. Finally my thanks go out to Circle Interactive for being generous hosts, Sean and Michael for their presentations and my fellow attendees for making Bristol’s CiviDay 2016 so enjoyable. Linux Mint is a great and popular Linux distribution. 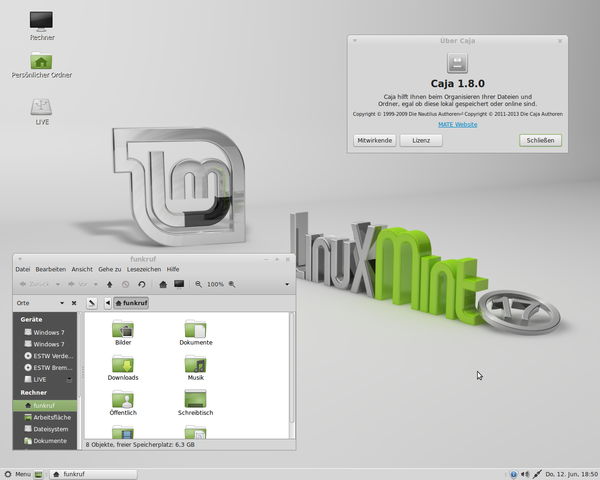 Screenshot of Linux Mint with MATE desktop. Image courtesy of Wikimedia Commons. Unfortunately its servers were recently compromised by malicious persons. If you’ve downloaded a Linux Mint disk image recently, we advise you to read on, as the text below appeared yesterday on and is reposted from the Linux Mint blog. I’m sorry I have to come with bad news. We were exposed to an intrusion today. It was brief and it shouldn’t impact many people, but if it impacts you, it’s very important you read the information below. Hackers made a modified Linux Mint ISO, with a backdoor in it, and managed to hack our website to point to it. As far as we know, the only compromised edition was Linux Mint 17.3 Cinnamon edition. If you downloaded another release or another edition, this does not affect you. If you downloaded via torrents or via a direct HTTP link, this doesn’t affect you either. Finally, the situation happened today, so it should only impact people who downloaded this edition on February 20th. 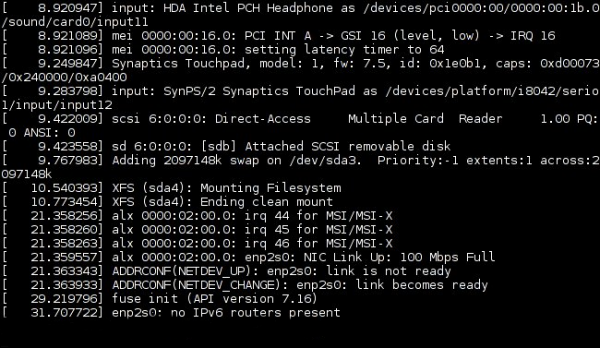 How to check if your ISO is compromised? If you still have the ISO file, check its MD5 signature with the command “md5sum yourfile.iso” (where yourfile.iso is the name of the ISO). If you still have the burnt DVD or USB stick, boot a computer or a virtual machine offline (turn off your router if in doubt) with it and let it load the live session. Once in the live session, if there is a file in /var/lib/man.cy, then this is an infected ISO. Delete the ISO. If you burnt it to DVD, trash the disc. If you burnt it to USB, format the stick. Backup your personal data, if any. Reinstall the OS or format the partition. Change your passwords for sensitive websites (for your email in particular). Is everything back to normal now? Not yet. We took the server down while we’re fixing the issue. The hacked ISOs are hosted on 5.104.175.212 and the backdoor connects to absentvodka.com. Both lead to Sofia, Bulgaria, and the name of 3 people over there. We don’t know their roles in this, but if we ask for an investigation, this is where it will start. What we don’t know is the motivation behind this attack. If more efforts are made to attack our project and if the goal is to hurt us, we’ll get in touch with authorities and security firms to confront the people behind this. If you’ve been affected by this, please do let us know. At the time of writing, the main Linux Mint website was offline. Let’s hope they are back up soon. 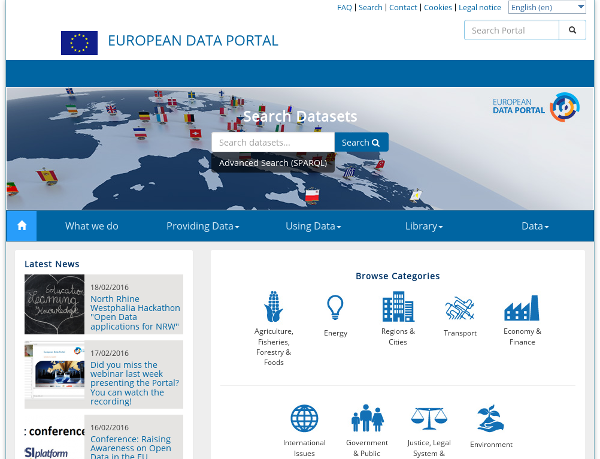 The European Data Portal started its normal operation today, German IT news website heise reports after spending the 3 months since November in a beta version. The intervening period has been used to eliminate known errors, incorporate additional data sources and to make the information available in 3 additional languages – Polish, Italian and Spanish – besides the original trio of English, German and French. The number of integrated data sets, which are drawn together from 70 external catalogues, has increased from 250,000 to more than 415,000. The portal also has a so-called Metadata Quality Assurance tool, which monitors the quality of the metadata, generates graphical reports and provides an overview of the current status of the availability and accessibility of each distribution. In addition it generates statistics on the data set compliance. Site contributors can also use this tool’s output to improve the quality of their data. The developer team is planning to release the source code for the overall platform and its technical components in a few weeks. A consortium led by Capgemini Consulting was awarded the contract for this major 3-year IT project in February last year. The aim is to make the data published by the authorities in 39 European countries centrally available. The costs of the project amount to a total of €6.5 mn., with almost half of this amount budgeted for the portal’s development and maintenance. The Linux Foundation yesterday announced the Zephyr™ Project, an open source collaborative effort to build a real-time operating system (RTOS) for the Internet of Things (IoT). Early supporters for the Zephyr Project include Intel Corporation (including its acquired business groups Altera Corporation and Wind River), NXP Semiconductors N.V. (including its recent merger with Freescale), Synopsys, Inc. and UbiquiOS Technology Limited. The Zephyr Project is also inviting others interested in this technology to participate. Industrial and consumer IoT devices require software that is scalable, secure and enables seamless connectivity. Developers also need the ability to innovate on top of a highly modular platform that easily integrates with embedded devices regardless of architecture. While Linux has proved to be a highly successful operating system for embedded development, some IoT devices require a real-time OS that addresses the very smallest memory footprints. Modularity and security are key considerations when building systems for embedded IoT devices. The Zephyr Project prioritizes these features by providing the freedom to use the RTOS as is or to tailor a solution. The project’s focus on security includes plans for a dedicated security working group and a delegated security maintainer. Broad communications and networking support is also addressed and will initially include Bluetooth, Bluetooth Low Energy and IEEE 802.15.4, with plans to expand communications and networking support over time. NXP FRDM-K64F Freedom board (Kinetis K64F ARM® Cortex®-M4 MCU). The Zephyr Project will also be having a booth at Embedded World 2016 in Nuremberg, Germany, to showcase the technology. Today The Document Foundation, the independent self-governing meritocratic body created by former leading members of the OpenOffice.org Community to continue developing a free and open source office suite – LibreOffice – celebrates the 4th anniversary of its incorporation as a charitable Foundation under German law (gemeinnützige rechtsfähige Stiftung des bürgerlichen Rechts). To mark this milestone, the Foundation has released the video below to illustrate the breadth of the LibreOffice community today. Happy birthday, The Document Foundation! Originally posted on the author’s own site. However, every year 14th February is also I Love Free Software Day. It’s the day when free software users around the world are encouraged to say thank you to the people that produce the great software that millions of people and businesses use and rely upon every other day of the year. all the other free software developers and package maintainers who are too numerous to mention. Along with the rest of the world, we’re indebted to you all. If you use free software too, we kindly ask you to support this annual campaign, which can be followed on social media with the #ilovefs hashtag. 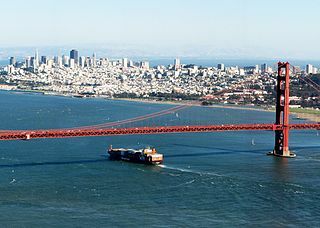 San Francisco is likely to become the first city to use open source software for elections, The Register reports. El Reg goes on to mention that the hope is for the city to develop balloting systems that can compete on reliability and security (with closed source, proprietary systems. Ed.) in time for the November 2019 elections. At present San Francisco has a long-standing contract for a proprietary voting with Dominion, formerly Sequoia Voting Systems. This contract has cost the city almost $20m in nine years, including $6.5m on hardware alone. The desire to develop an open source voting system in California dates back some years. In 2013 a bill allowing cities to use public funds to “research and develop a non-proprietary voting system” was passed by the California Senate and signed by the governor, Jerry Brown. The bill passed by the State Senate followed more than six years of efforts by San Francisco residents to move to an open-source approach after it was revealed the previous system’s ancient machines could only read dark colours. Elsewhere in the world there has also been criticism and mistrust of proprietary voting systems, such as for example in Germany, where in 2009 the Constitutional Court ruled the NEDAP voting computers then in use to be unconstitutional. Russian government to switch to desktop Linux? Steve Woods	International IT News, Open Source News	 February 11, 2016 Comments Off on Russian government to switch to desktop Linux? The Russian government is reported to be contemplating dropping Microsoft Windows and adopting Linux as the operating system for agency PCs according to its internet czar, German Klimenko. Mr Klimenko is reported as saying in an interview with Bloomberg, the business, financial and media company that Russia will consider moving all of its networks off the Microsoft platform and onto an unspecified Linux distribution instead. Microsoft, Google and other U.S. companies “reached the point of no return” when they complied with sanctions over Putin’s annexation of Crimea by halting all business with the peninsula, according to Klimenko. As a result, it’s “inevitable” Russia will switch state networks from Windows to an open-source system based on Linux, a move 22,000 municipal governments are prepared to make immediately, he said. “It’s like a wife seeing her husband with another woman — he can swear an oath afterward, but the trust is lost,” Klimenko said. The Document Foundation has announced the release today of LibreOffice 5.1, a full featured open source office suite with superior interoperability features, for all major platforms – Linux, Mac OSX and Windows. Compared with previous releases, LibreOffice 5.1 offers a completely overhauled user interface and several improved features targeted at enterprise deployments, e.g. better support for ODF 1.2, interoperability with proprietary document formats and file management on remote servers. LibreOffice has been downloaded 120 million times since its launch in January 2011 and is now being deployed by large organisations around the world, the latest addition being for Italian defence staff with over 100,000 desktops (posts passim). User Interface: LibreOffice 5.1’s user interface has been completely reorganised to provide faster, more convenient access to its most used features. A new menu has been added to each of the applications: Style (Writer), Sheet (Calc) and Slide (Impress and Draw). In addition, several icons and menu commands have been repositioned based on user preferences. Interoperability: Compatibility with proprietary document formats – principally MS Office formats – has been improved as a part of continuing efforts for better interoperability with other office packages. The latest interoperability changes include the addition of filters for Apple Keynote 6, Microsoft Write and Gnumeric files. File Access on Remote Servers: Files stored in the cloud on remote servers such as Sharepoint, Google Drive and Alfresco can now be accessed from the File menu, with read and write options and without the need of a dialog window. The LibreOffice website has a complete list of the most significant new features of LibreOffice 5.1. LibreOffice 5.1 has also been improved “under the hood,” thanks to the work of hundreds of volunteers. Their work has produced an open source office suite that’s easier to develop, maintain and debug. Although this is not visible to users, it is extremely important for enterprise deployments. LibreOffice 5.1 represents the bleeding edge in term of features for open source office suites and is targeted at technology enthusiasts, early adopters and power users. For enterprise class deployments, TDF maintains the more mature 5.0.x branch (soon at 5.0.5). In any case, TDF suggests deploying or migrating to LibreOffice with the backing of certified professionals providing Level 3 support, migration consultancy or trainings according to recognized best practices (http://www.libreoffice.org/get-help/professional-support/). LibreOffice 5.1 is available for immediate download. 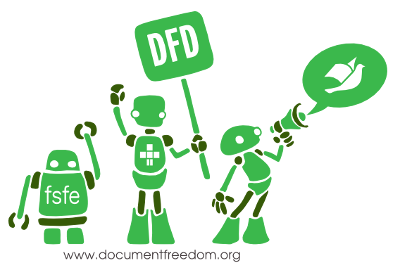 LibreOffice users, free software advocates and all community members can also support The Document Foundation with a donation. Reposted from the author’s blog.